The main concern with this particular shoot was as to whether we would be able to achieve the shots we wanted with the width of the room, as although the ceiling height is fantastic, the overall width was narrow creating more of a galley. 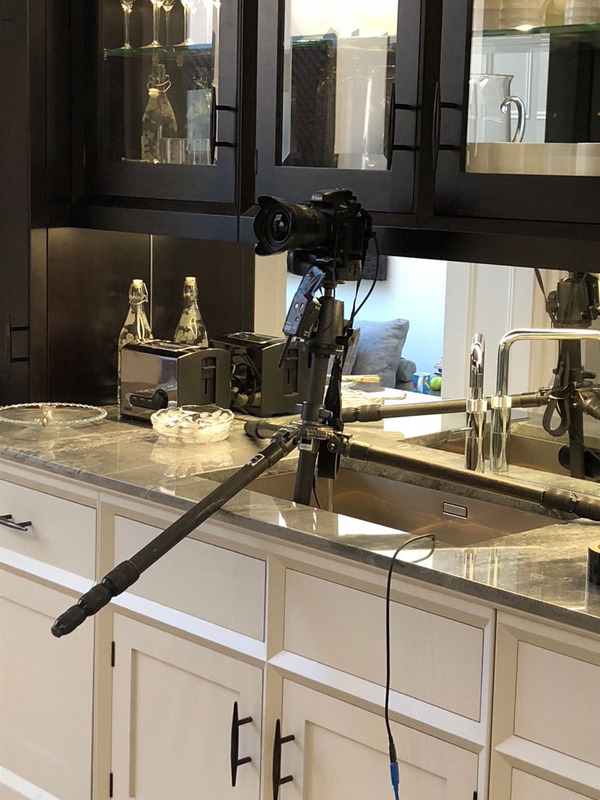 As you can see, some ingenuity was required to create the ideal position for the camera to sit and then a rather painstaking process of adjustments to get the perfect angle. 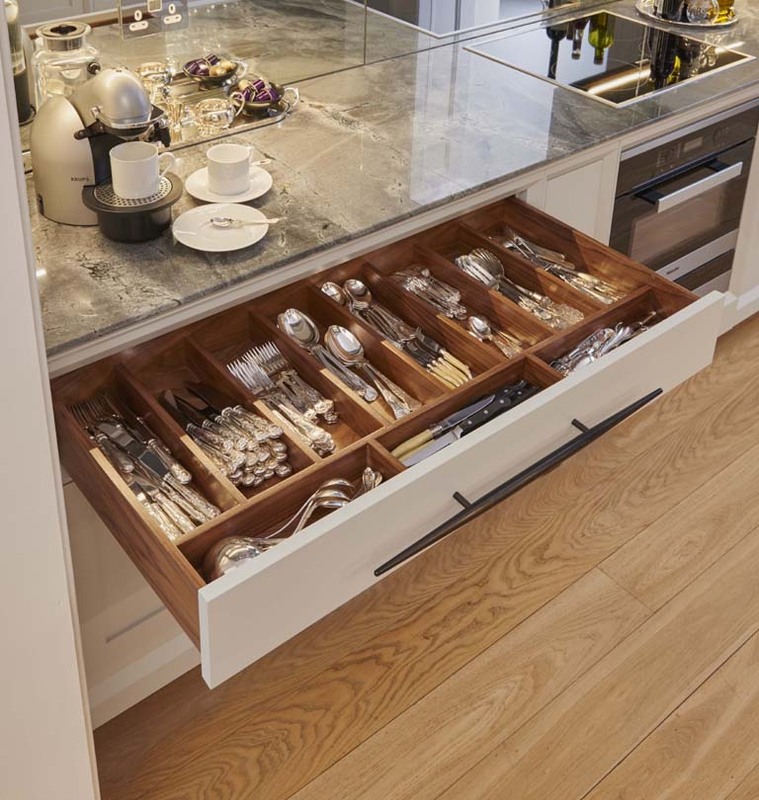 When I met with the client to take the original brief for the space, the overriding factor was that it should look like a room of beautiful furniture and certainly not a utilitarian kitchen. The main kitchen in this residence was located in another part of the house, so there wasn’t the need to fill the space with an abundance of appliances. It also meant that we could build a lot of glazed units in to the design and the client was very receptive to the idea of using mirrors which has a very dramatic effect in what is a narrow area. 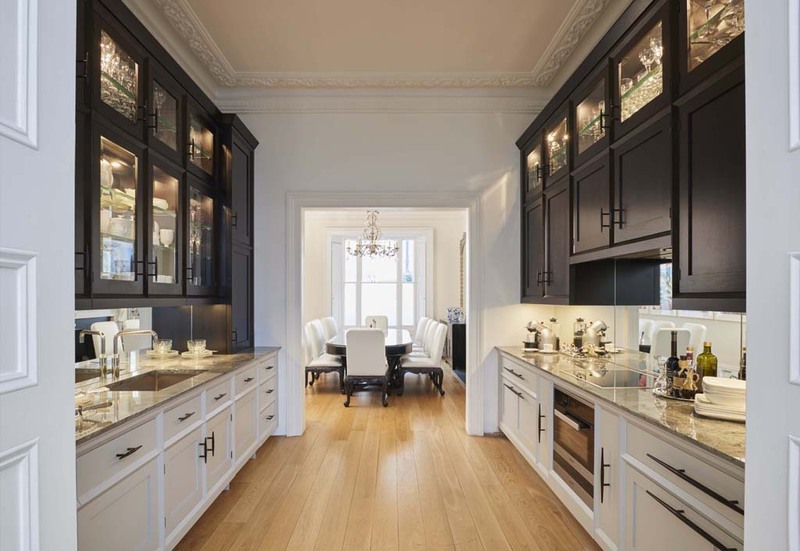 The kitchen links the two adjoining rooms, which are a wonderful tall ceiling dining space and on the other side a fabulous informal living room. The client had some stunning Japanese artwork in the dining room and Trevor managed to capture the reflection of some of it in the photos of the hob run. Once the main shots had been taken, we focused on a number of detail images, then, satisfied that we had everything we wanted, attentions were turned to the rather daunting task of returning the three rooms back to their original states and I had rather underestimated the time involved to do this! After an hour of referring back to my original snap shots, and a rather painful encounter with the clients Christmas tree, we were confident that all was as it should be. Trevor’s kit still needed to be packed away, but we were on the home straight, although we were still some way off getting to see the final images however as Trevor needed to spend some time refining them. The post production of this project proved quite tricky owing partly to the mirrors. Trevor needed to touch out the camera that appeared in the reflection as well as some of the under-unit strip lights. The format in which agency’s like to receive the images changes periodically – at this point in time less lighting is favoured, which was obviously tricky with this project having so many lit glazed units. As well as using the photographs for our own purposes, we love to have editorial features in the homes & interiors and lifestyle magazines, but if they are not tailored specifically to what the editors are looking for then there is far less of a chance of having anything featured. A week or so after the shoot, Trevor sends over the much-awaited disc of images. The results are better than expected and instantly vindicate the time invested in conducting all of this. I am still staggered as to how he managed to get the results and also have the vision to realise that it was all worth doing after only having my incredibly poorly taken original iPhone shoots to go by! So, we are left with this wonderful record that we wanted, and a client extremely flattered and proud that it was their project chosen. It’s on to the next one now and another day with Trevor and Mark in prospect. I just hope that there aren’t as many glazed units next time around! Andy and Mark are both based at our Chelsea showroom, and if you would like to discuss your project with them then you are welcome to pop in and see them.